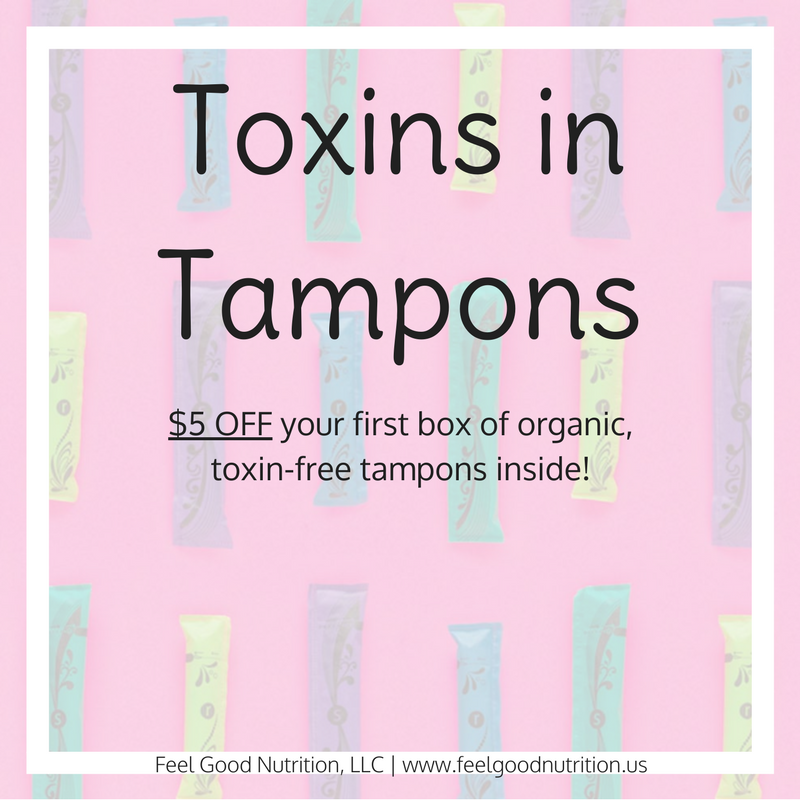 Toxins in Tampons – $5 OFF a box of organic tampons! The average woman uses over 11,000 tampons in her lifetime. Let me be totally honest with you… A couple weeks ago is the first time I really started thinking about the chemicals in our environment and personal care products and their effect on our bodies. I was so concerned with the chemicals and artificial ingredients in our food system that I completely missed this HUGE issue that contributes to many of our diseases today – toxins. Toxins are in our air, water, food, soil and products. Out of those 5 sources, there are only a couple that we have control over – food and products are the big ones. I talk about food a lot so now I’d like to bring attention to our products – one product in particular – tampons. Did you ever bother to look at the Tampax tampon website? I know I didn’t until recently. I’m going to pick on Tampax for a little bit. Their tampons “are made from the same ingredients as most other feminine care products on the market”. Just because other companies use them, does that make it right? As consumers we have to do our research. The cotton used in our tampons is non-organic (unless otherwise stated). Do you know what we use in the growing process? Let me tell you. GMO seeds are necessary in conventional cotton farming. The land used to grow cotton has not increased over the years, yet our cotton yield has increased by 300%. Seeds are treated with fungicides and insecticides. Once planted, synthetic fertilizers aid in the growing process. Weeds and pests are controlled with herbicides, insecticides and pesticides. Finally, we harvest the cotton and use more toxic chemicals to remove the leaves. From this end product, we make tampons and other products. Let me say this again – we use over 11,000 of tampons in our lifetime! The toxins add up ladies! Go grab one of your tampons (trust me you won’t want to use them anymore after this). Unwrap it and place it in a glass of water. After it absorbs the water, remove it, and watch all the remaining fibers floating in the water. These toxin-laced fibers are hanging out in your uterus each time you use a tampon. Side note: your skin is the largest organ in your body. On top of that, your lady parts are especially sensitive and highly permeable. What does that mean? It means that traces of the above chemicals used to grow cotton leach into your body and can have nasty effects. Earlier I touched on the ingredients in Tampax tampons, lets go back to that real quick and talk about why they are bad. The use of viscous rayon (the only rayon allowed in tampons) has the ability to amplify toxins to some extent. In the US, we spray more than one billion tons of pesticides and herbicides on cotton crops yearly. After harvesting and processing there are residual chemicals that remains on tampons. These can have damaging effects to the nervous system, lead to cancer and even hormone disruption. An example of hormone disruption is high levels of estrogen hormone. This is linked to a higher risk of developing endometriosis and fibroids. Bonus to buying organic tampons:The lowest risk of developing Toxic Shock Syndrome is with the use of all cotton tampons. As of now the FDA does not require testing for toxic levels of chemicals in tampons and does not require package warnings. 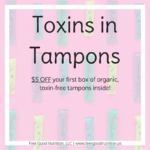 I hope you leave here feeling like an educated consumer – click this referral link for $5 off a box of organic tampons by SHE, a company created by three sisters who saw a need for a product that is better for us and for our environment. Most of us eat nuts and seeds on a daily basis – whether it is in the form of nut/seed butter, nut milk, or just plain old nuts and seeds. 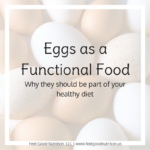 This tiny little nutrient packed superfood has found its way into many diets, however, to truly gain all of the benefits they require an extra step prior to your enjoyment! Why not eat raw nuts and seeds? Raw nuts (and seeds) contain phytic acid – the storage form of phosphorus in plant tissues. So why is this a problem? Phytates binds to minerals in your GI tract which can cause irritation and contribute to potential nutrient deficiencies. Of course you could take phytase in the form of a supplement – like Pure Encapsulations Digestive Enzyme Ultra – every time that you eat nuts and seeds but I think there is a simpler (and cheaper) answer! 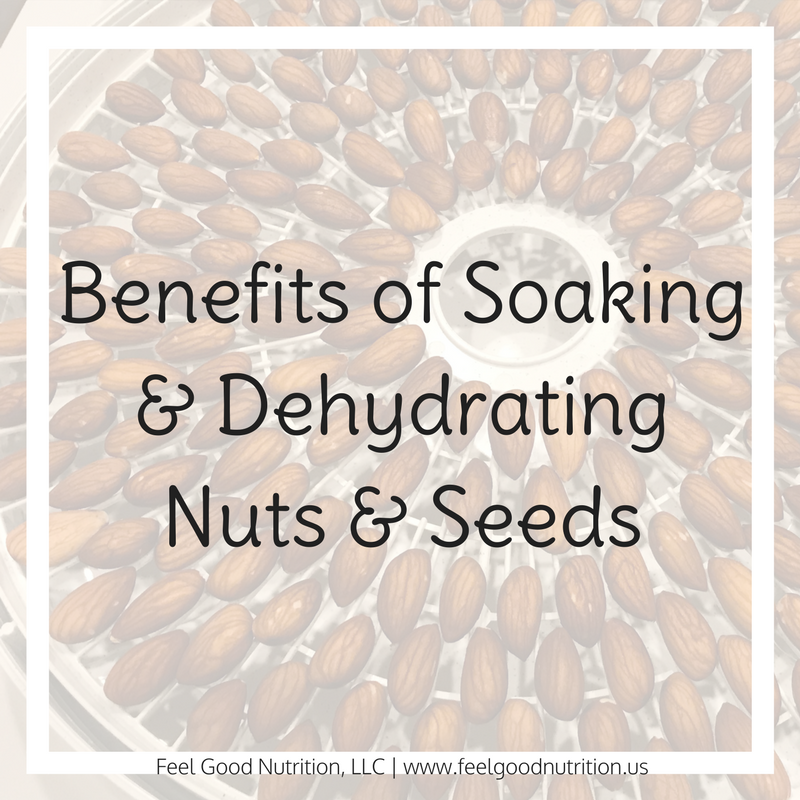 Before we get to that there is one more big reason to soak and dehydrate your nuts and seeds. Raw nuts also contain enzyme inhibitors, which prevent the nut or seed from sprouting prematurely in nature. This is great for the nuts in nature but when they have been gathered for consumption something has to change. Eating too many raw nuts that still contain enzyme inhibitors can contribute to the binding of minerals and again lead to digestive strain. 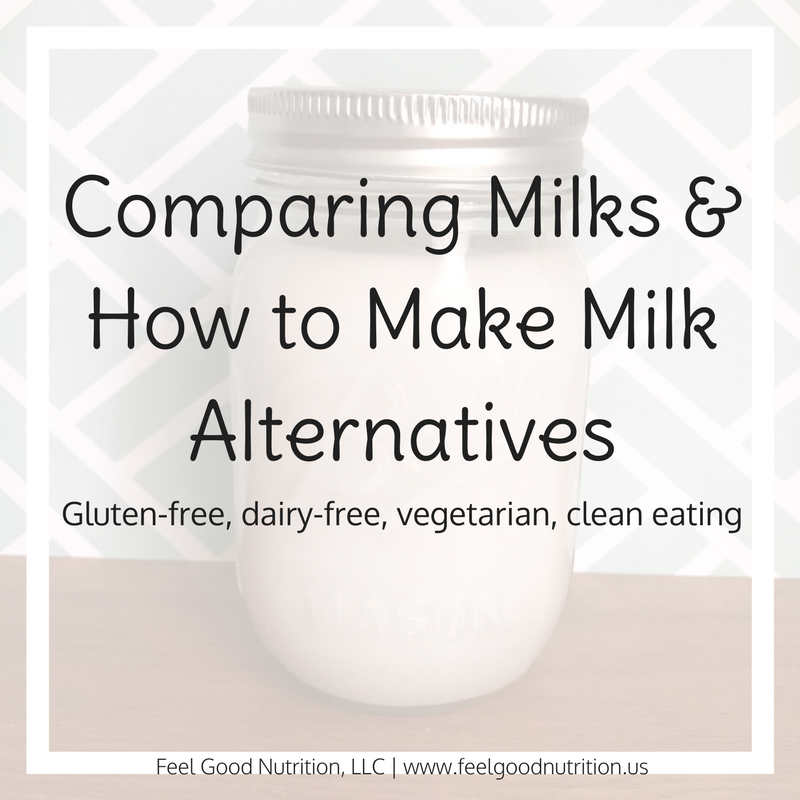 How does soaking and dehydrating help? 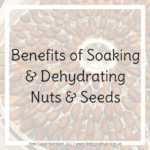 Soaking raw nuts and seeds in salt water and then dehydrating at a low temperature (around 105-115F) tricks the phytates and enzyme inhibitors into a neutral state. The combination of minerals and low heat helps break down irritating compounds, while preserving beneficial fats and proteins. 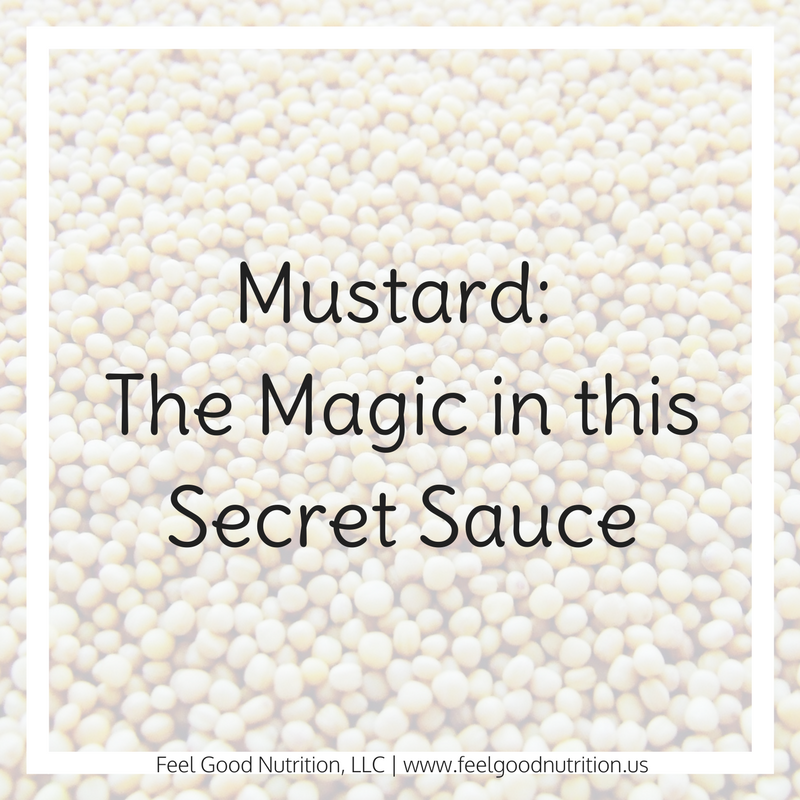 This process increases the bioavailability of important nutrients (notably the treasured B vitamins) and activates helpful digestive enzymes that increase nutrient absorption. If you do not want to complete this process yourself it is possible to purchase, however, the cost can be significant in comparison to purchasing raw nuts and soaking/dehydrating them yourself. If you look to purchase these nuts, they are different from sprouted nuts as sprouting is a much lengthier process. Do you ever experience low belly pain after eating nuts, seeds or foods that contain them? Do you ever notice pieces of nuts in your stool the day after eating them? Do you eat a significant amount of phytate containing foods- such as grains, beans, nuts and seeds? Do you struggle to consume enough minerals and B-vitamins in your diet? Do you eat a lot of phytate-containing foods and your micronutrient test came back showing a deficiency in B-vitamins and minerals? If you answered yes to any of the above questions, you will likely benefit from soaking and drying nuts prior to snacking on them. 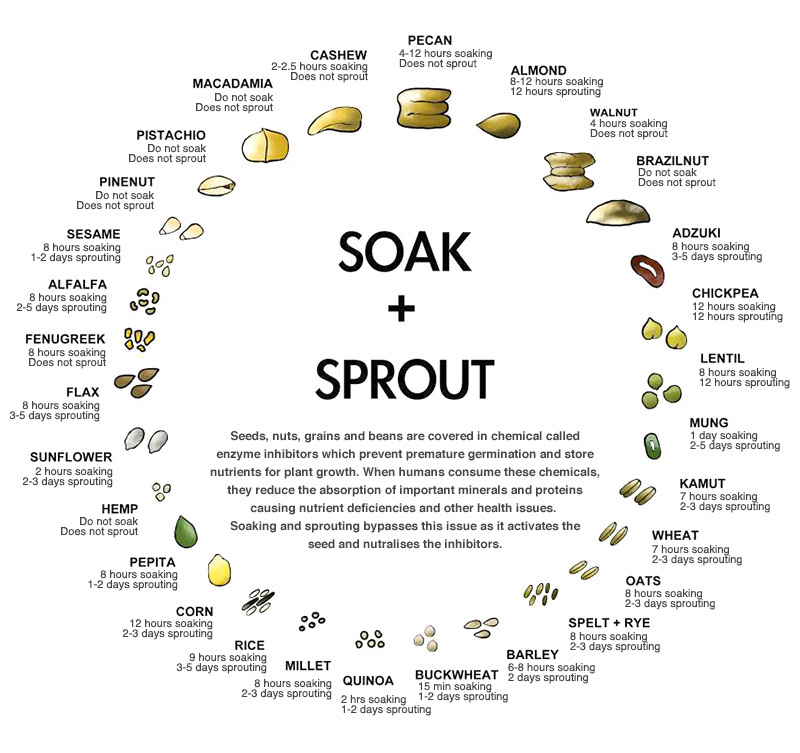 Below is a great graphic that indicates the time that nuts/seeds should be soaked – and if you feel like going the extra mile you can try sprouting! Keeping the temperature under 118F maintains its “raw” status and does not comprising any of the nutrients. If you do not have a dehydrator you can dehydrate nuts in your oven at its lowest temperature – preferably at least close to 150F. Continue to watch your nuts as time will vary based on method of dehydrating. Let us know which nuts/seeds you dehydrate! 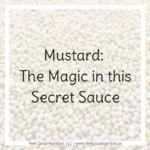 This week I wanted to take a break from the recipes and talk about the importance of knowledge. The more we know the better choices we can make. This is especially important when it comes to our health. 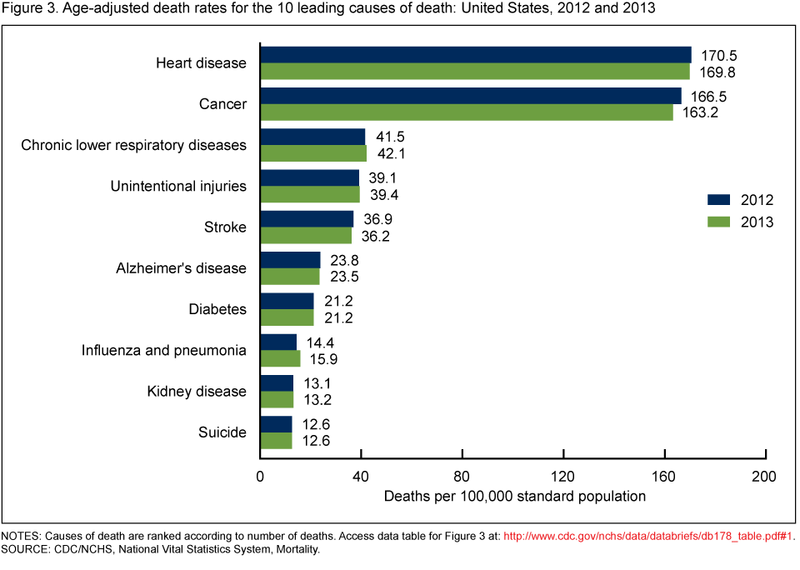 Did you know that nearly 75% of all deaths in the US are attributed to just 10 causes. 10… I can count that on two hands (or feet). The top 3 are responsible for 50% of deaths. That’s a lot of death! What kills me is that most of this boils down to HEALTH. The leading cause of death in the United States is heart disease (coronary artery disease, heart attack, congestive heart failure – just to name a few). I work in a hospital and it is almost surprising when a patient does not have one of these diagnoses. Everyday I talk to people about what foods contain carbohydrates, protein and fat (No… chicken is not a carbohydrate). Let me tell you – if you know the answer to this question you are ahead of most… sadly. I think the blame could go in a lot of directions – lack of education in school systems, processed food industry insisting that more chemicals are better (they’re not. ), lack of curiosity on the part of every individual. Now a days we all have internet and we are all capable of a Google search. Lets bring this down to a personal level. There are many other common conditions out there that may not lead to death. I bet each and every one of you know someone who suffers from chronic headaches or migraines, irritable bowel syndrome, fibromyalgia, multiple sclerosis, arthritis… the list goes on. Depending on the severity these conditions can be debilitating. They may prevent you from leaving your house or having the social life you deserve. With all of the chemicals and mixed foods that we are eating, food sensitivities are a common culprit. I’m not naive to say that it will cure your MS or completely eliminate your arthritis, however, I am 100% confident in saying that eliminating the foods that are contributing to your problem will help you manage the arthritis pain, allow you to leave the house without worrying where the closest bathroom is, and live your life like its supposed to be lived. In the two years that I have been practicing LEAP I have had so many clients with great success. Periodically I will be sharing their success stories with you so that maybe, just maybe, you decide that its finally time to step up or convince a friend or family member that they need to learn about what is contributing to their uncomfortable symptoms. 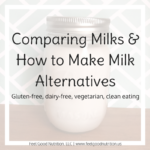 Food Sensitivities/Food Intolerances/Food Allergies – whats the difference? Food allergies, intolerances and sensitivities are a hot button topic lately. The definitions are commonly confused so I thought I would take minute to clear it up. Food Allergies: Food allergies are an immune reaction that result when our immune system attacks a harmless food protein (an allergen). The body produces a large amount of the antibody IgE (Immunoglobulin E) and releases chemicals (ex. histamine) which trigger symptoms of an allergic reaction. Diagnosing food allergies: There are several ways to test for food allergies. Skin Prick Test – This is when the allergist drops solutions of food on your arm or back and waits about 30 minutes for a response. They are looking for a wheal and flare response which is a raised white bump surrounded by itchy red skin. The skin prick test has a 50-60% chances of showing a false positive meaning that you are not really allergic to the foods being tested. NOT IDEAL. Blood Test – The blood tests do not help you predict the severity of an allergy but will tell you if you could have an allergy. It takes several days to get the results back, unlike the skin prick test. This tests can detect either your response to the undigested food proteins OR detect proteins that are similar among foods but do not trigger allergic reaction. Because of this the blood test also has a 50-60% chance of yielding a false positive result. NOT IDEAL. Oral Food Challenge – This test is highly accurate but also has the potential to cause serious reactions and should only be done in the presence of an experienced allergist in a medical facility. During the food challenge, the allergist will feed you suspect foods in small doses repeatedly to see if there are any signs of a reaction. IDEAL. Food Elimination Diet – A food elimination diet can be used to help diagnose a food allergy. During a 2-4 week period you eliminate any suspect foods while the doctor monitors symptoms. 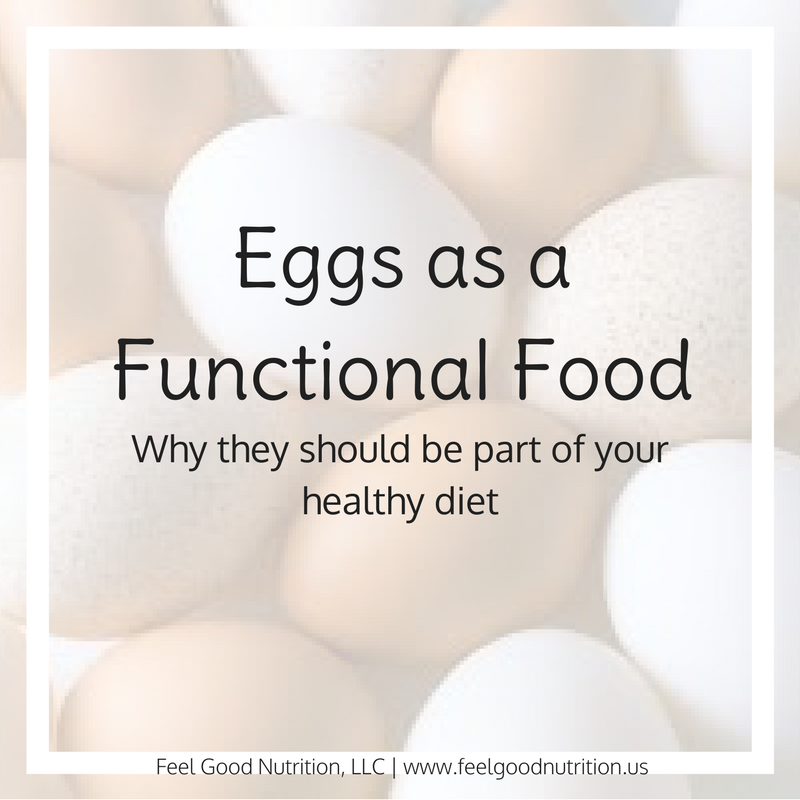 There is a gradual period of reintroduction when you add in suspecting foods and continue to monitor symptoms. IDEAL. Food Intolerances: Food intolerances do not involve the immune system. Some food intolerances are caused by a lack of a particular enzyme. Symptoms may appear similar to a food allergy but they will never trigger anaphylaxis. Most of the time, symptoms of a food intolerance take longer to manifest than symptoms of food allergies. Diagnosing food intolerances: There is no accurate, reliable and validated test to identify food intolerances. The best tool is an elimination diet. Foods and symptoms are monitored and analyzed for patterns between food intake and symptom manifestation. Food Sensitivities: Food sensitivities, like food allergies, involve the immune system however they are not measuring IgE antibodies. Food sensitivities can occur with any food/chemical and reactions can occur up to 72 hours after ingesting the offending food. Sensitivities involve non-IgE antibodies and chemical mediators – because of this allergy testing will NOT test for them. Symptoms: headaches/migraines, irritable bowel, bloating, diarrhea, joint pain, fatigue, etc. The list goes on and on. ELISA/ACT Test – Uses an accurate measure of IgG however, adverse food reactions often involve more than just IgG reactions. For example, this test is not useful for IBS and migraines and it cannot test chemical reactions. IgG may appear high because it is acting as a protective antibody, in which case it may be a good thing. There are no published studies of reliability or validity. ALCAT Test – Measures changes in white blood cell size after exposure to an antigen (food). While early studies showed good accuracy (86%) this is now an outdated technology and cannot measure lymphocyte reactions. MRT Test – Measures changes in ratio of liquid to solids after whole blood exposure to an antigen (food). This test has excellent accuracy (94.5% sensitivity and 91.7% specificity) and reliability ( >90% split sample reproducibility). With this test we can measure food and chemical reactions by measuring the outcome of all sensitivity reactions. This is the best test for food sensitivities available at this time. Susan Linke, food sensitivity expert and LEAP mentor does a great job explaining food sensitivities in this video.